American test pilot mission specialist astronaut 1978-1992. Grew up in Fargo, North Dakota. Status: Inactive; Active 1978-1992. Born: 1945-06-20. Spaceflights: 4 . Total time in space: 20.43 days. Birth Place: New Rockford, North Dakota. PERSONAL DATA: Born June 20, 1945, in New Rockford, North Dakota, but also considers Fargo, North Dakota, as his hometown. Married to the former Jean Oliver of Pensacola, Florida. Two grown children. Recreational interests include skiing, scuba diving, hunting, fishing, and racquetball. His parents, Mr. and Mrs. Martin A. Buchli, reside in Fargo, North Dakota. Her parents, Mr. and Mrs. James O. Oliver, reside in Pensacola, Florida. EDUCATION: Graduated from Fargo Central High School, Fargo, North Dakota, in 1963; received a bachelor of science degree in Aeronautical Engineering from the United States Naval Academy in 1967 and a master of science degree in Aeronautical Engineering Systems from the University of West Florida in 1975. ORGANIZATIONS: Associate member of Naval Academy Alumni, American Legion, Association of Space Explorers, and American Geophysical Union. SPECIAL HONORS: Recipient of the Defense Service Medal, Legion of Merit, Defense Meritorious Service Medal, four NASA Space Flight Medals, NASA Exceptional Service Medal, NASA Distinguished Service Medal, Air Medal, Navy Commendation Medal, Purple Heart, Combat Action Ribbon, Presidential Unit Citation, Navy Unit Citation, a Meritorious Unit Citation, and a Vietnamese Cross of Gallantry with the Silver Star. EXPERIENCE: Buchli received his commission in the United States Marine Corps following graduation from the United States Naval Academy at Annapolis in 1967. He graduated from U.S. Marine Corps Basic Infantry Course and was subsequently sent to the Republic of Vietnam for a 1-year tour of duty, where he served as Platoon Commander, 9th Marine Regiment, and then as Company Commander and Executive Officer, "B" Company, 3rd Company, 3rd Reconnaissance Battalion. He returned to the United States in 1969 for naval flight officer training at Pensacola, Florida, and spent the next 2 years assigned to Marine Fighter/Attack Squadron 122, at Kaneohe Bay, Hawaii, and Iwakuni, Japan; and in 1973, he proceeded to duty with Marine Fighter/Attack Squadron 115 at Namphong, Thailand, and Iwakuni, Japan. Upon completing this tour of duty, he again returned to the United States and participated in the Marine Advanced Degree Program at the University of West Florida. He was assigned subsequently to Marine Fighter/Attack Squadron 312 at the Marine Corps Air Station, Beaufort, South Carolina, and in 1977, to the U.S. Test Pilot School, Patuxent River, Maryland. He has logged over 4,200 hours flying time -- 4,000 hours in jet aircraft. NASA EXPERIENCE: Buchli became a NASA astronaut in August 1979. 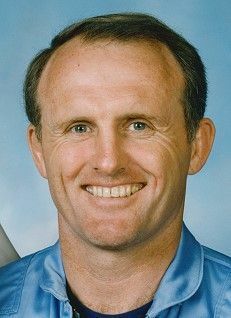 He was a member of the support crew for STS-1 and STS-2, and On-Orbit CAPCOM for STS-2. A veteran of four space flights, Buchli has orbited the earth 319 times, traveling 7.74 million miles in 20 days, 10 hours, 25 minutes, 32 seconds. He served as a mission specialist on STS-51C (January 24-27, 1995), STS-61A (October 30 to November 6, 1985), STS-29 (March 13-18, 1989), and STS-48 (Sep 12-18, 1991). From March 1989 till May 1992 he also served as Deputy Chief of the Astronaut Office. On 1 September 1992 Buchli retired from the U.S. Marine Corps and the NASA Astronaut Office to accept a position as Manager, Space Station Systems Operations and Requirements with Boeing Defense and Space Group, Huntsville, Alabama. In April 1993, he was reassigned as Boeing Deputy for Payload Operations, Space Station Freedom Program. Buchli currently serves as Operations & Utilization Manager for Space Station, Boeing Defense and Space Group, Houston, Texas. SPACE FLIGHT EXPERIENCE: STS 51-C Discovery, was the first dedicated Department of Defense mission. Launched January 24, 1985, from Kennedy Space Center, Florida, STS-51C performed its DOD mission which included deployment of a modified Inertial Upper Stage (IUS) vehicle from the Space Shuttle. Landing occurred on January 27, 1985, after slightly more than three days on orbit. Mission duration was 73 hours, 33 minutes, 27 seconds. STS-61A Challenger (October 30 to Novenber 6, 1985) was a West German D-1 Spacelab mission, the first to carry eight crew members, the largest crew to fly in space, and the first in which payload activities were controlled from outside the United States. More than 75 scientific experiments were completed in the areas of physiological sciences, materials processing, biology, and navigation. Mission duration was 168 hours, 44 minutes, 51 seconds. STS-29 Discovery (March 13-18, 1989) was a highly successful five day mission during which the crew deployed a Tracking and Data Relay Satellite, and performed numerous secondary experiments, including a space station "heat pipe" radiator experiment, two student experiments, a protein crystal growth experiment, and a chromosome and plant cell division experiment. In addition, the crew took over 3,000 photographs of the earth using several types of cameras, including the IMAX 70 mm movie camera. Mission duration was 119 hours, 39 minutes, 40 seconds. STS-48 Discovery (September 12-18, 1991) was a five day mission during which the crew deployed the Upper Atmosphere Research Satellite (UARS) designed to provide scientists with their first complete data set on the upper atmosphere's chemistry, winds and energy inputs. The crew also conducted numerous secondary experiments ranging from growing protein crystals, to studying how fluids and structures react in weightlessness. Mission duration was 128 hours, 27 minutes; 34 seconds. BIRTHPLACE AND DATE: Born June 20, 1945, in New Rockford, North Dakota, but considers Fargo, North Dakota, as his hometown, where his parents, Mr. and Mrs. Martin A. Buchli, reside. PHYSICAL DESCRIPTION: Brown hair; hazel eyes; 5 feet 7 inches; 170 pounds. MARITAL STATUS: Married to the former Jean Oliver of Pensacola, Florida. Her parents, Mr. and Mrs. James C. Oliver, reside in Pensacola, Florida. CHILDREN: James C., September 9, 1972; Jennifer C., April 29, 1977. RECREATIONAL INTERESTS: He enjoys skiing, scuba diving, hunting, fishing, racquetball, water-skiing, camping, and canoeing. ORGANIZATIONS: Associate member of Naval Academy Alumni. SPECIAL HONORS: Recipient of the Defense Superior Service Medal, Defense Meritorious Service Medal, three NASA Space Flight Medals, NASA Exceptional Service Medal, Air Medal, Navy Commendation Medal, Purple Heart, Combat Action Ribbon, Presidential Unit Citation, Navy Unit Citation, a Meritorious Unit Citation, and a Vietnamese Cross of Gallantry with the Silver Star. EXPERIENCE: Buchli received his commission in the United States Marine Corps following graduation from the United States Naval Academy at Annapolis in 1967. In 1968, he graduated from U.S. Marine Corps Basic Infantry Course and was subsequently sent to the Republic of Vietnam for a 1-year tour of duty where he served as Platoon Commander, 9th Marine Regiment, and then as Company Commander and Executive Officer, "B" Company, 3rd Reconnaissance Battalion. He returned to the United States in 1969 for naval flight officer training at Pensacola, Florida, and spent the next 2 years assigned to Marine Fighter/Attack Squadron 235 at Kaneohe Bay, Hawaii. In 1972, Buchli was reassigned to Marine Fighter/Attack Squadron 122, at Kaneohe Bay, Hawaii, and Iwakuni, Japan; and in 1973, he proceeded to duty with Marine Fighter/Attack Squadron 115 at Namphong, Thailand, and Iwakuni, Japan. Upon completing this tour of duty, he again returned to the United States and participated in the Marine Advanced Degree Program at the University of West Florida. He was assigned subsequently to Marine Fighter/Attack Squadron 312 at the Marine Corps Air Station, Beaufort, South Carolina, and, in 1977, to the U.S. Test Pilot School, Patuxent River, Maryland. NASA EXPERIENCE: Buchli became a NASA astronaut in August 1979. He was a member of the support crew for STS-1 and STS-2, and On-Orbit CAPCOM for STS-2. A veteran of four space flights, Buchli was a mission specialist on STS 51-C and STS 61-A in 1985, STS-29 in 1989, and STS-48 in 1991. From March 1989 till May 1992 Buchli also served as Deputy Chief of the Astronaut Office. On his first flight, Buchli was a crew member on STS 51-C, the first Space Shuttle Department of Defense mission, which launched from Kennedy Space Center, Florida, on January 24, 1985. Mission 51-C performed its DOD mission which included deployment of a modified Inertial Upper Stage (IUS) vehicle from the Space Shuttle Discovery. Landing occurred on January 27, 1985, at Edwards Air Force Base, California after slightly more than three days on orbit. He then served on the crew of STS 61-A (October 30 - Nov. 6, 1985). STS 61-A, a West German D-1 Spacelab mission, was the first to carry eight crew members, the largest crew to fly in space, and was also the first in which payload activities were controlled from outside the United States. More than 75 scientific experiments were completed in the areas of physiological sciences, materials processing, biology, and navigation. Mission duration was 111 orbits. Buchli also served on the crew of STS-29 (March 13-18, 1989). During this highly successful five-day mission, the crew aboard the Orbiter Discovery deployed a Tracking and Data Relay Satellite, and performed numerous secondary experiments, including a Space Station "heat pipe" radiator experiment, two student experiments, a protein crystal growth experiment, and a chromosome and plant cell division experiment. In addition, the crew took over 3,000 photographs of the earth using several types of cameras, including the IMAX 70 mm movie camera. Mission duration was 80 orbits. More recently, he was a crew member on STS-48 (September 12-18, 1991). This was a five-day mission during which the crew deployed the Upper Atmosphere Research Satellite (UARS) which is designed to provide scientists with their first complete data set on the upper atmosphere's chemistry, winds and energy inputs. The crew also conducted numerous secondary experiments ranging from growing protein crystals, to studying how fluids and structures react in weightlessness. Mission duration was 81 orbits. With the completion of his fourth mission, Buchli has logged over 490 hours in space. On May 29, 1992, Buchli announced that he will retire from the U.S. Marine Corps and leave NASA in August to accept the position of Manager, Station Systems Operations and Requirements with Boeing Defense and Space Group, Huntsville, Alabama. Family: Astronaut. Country: USA. Flights: STS-10, STS-41-E, STS-51-C, STS-61-A, STS-61-H, STS-29, STS-48. Projects: STS. Agency: USN. Bibliography: 12, 5214. Birth of James Frederick 'Jim' Buchli - . Nation: USA. Related Persons: Buchli. American test pilot mission specialist astronaut 1978-1992. Grew up in Fargo, North Dakota. 4 spaceflights, 20.4 days in space. Flew to orbit on STS-51C (1985), STS-61A, STS-29, STS-48..
STS-10 (cancelled) - . Crew: Buchli, Mattingly, Onizuka, Payton, Shriver. Backup Crew: Wright, Keith. Payload: DoD Mission. Nation: USA. Program: STS. Flight: STS-10. Planned Department of Defense shuttle mission. Cancelled due to payload delays.. Landing of STS-51-C - . Return Crew: Buchli, Mattingly, Onizuka, Payton, Shriver. Nation: USA. Related Persons: Buchli, Mattingly, Onizuka, Payton, Shriver. Program: STS. Flight: STS-51-C. STS-51-C landed at 21:28 GMT. .